Sylvester Porubsky was the son of John and Catherine Porubsky and was Grandma Caroline Wolford’s first cousin. John Porubsky and grandma’s father Carl were brothers. Sylvester was born on 15 November 1916 in Plains, Kansas. “The battalion was attached to the 311th Infantry of the 78th Infantry Division. At 0815 on the morning of January 2, a messenger arrived from the regimental commander of the 311th. The message read, “We must have a prisoner by 2400 hours.” Able Company was alerted to the mission and planning began. The day was relatively quiet. There was some incoming German mortar fire, and a German self-propelled gun fired twenty-five rounds without causing injury. Seven enemy planes flew overhead but they did not strafe As evening came on heavy vehicular movement could be heard from the German lines but it was soon quiet. On April 6, we lost Lt. Porubsky, not as a war casualty, but as a matrimonial victim to an army nurse. It appears our Lt. had gotten himself engaged when he was back in Schmidthof. How after a couple of months of waiting, he finally had received the permission to marry the girl. That day saw the Lt. nervously packing his belongings and throwing them on a jeep which awaited him. That night we had one bachelor less in the company. “Congratulations” and best wishes, Lt. May happiness and health follow your every footstep through your journey of life and may your marriage bring you the bliss the enjoyment you had so rightfully earned for yourself. The President of the United States of America, under the provisions of the Act of Congress approved July 9, 1918, takes pride in presenting the Distinguished Service Cross (Posthumously) to First Lieutenant (Infantry) Sylvester V. Porubsky (ASN: 0-1313302), United States Army, for extraordinary heroism in connection with military operations against an armed enemy of the United Nations while serving with Company A, 27th Infantry Regiment, 25th Infantry Division. First Lieutenant Porubsky distinguished himself by extraordinary heroism in action against enemy aggressor forces near Chirwon-ni, Korea, on 1 September 1950. On this date, Company A was assigned the mission of retaking a ridge in the vicinity of Chirwon-ni, Korea. Shortly after darkness Lieutenant Porubsky deployed his platoon in a skirmish line and moved slowly and silently up the hill through the hostile fire. When the silently-moving group unnerved the enemy and flashes from their weapons disclosed the hostile positions, Lieutenant Porubsky and his platoon neutralized the opposition with grenades. As the platoon continued its movement up the hill, the enemy, terrified by the silent attack, hastily abandoned their positions and fled. When the enemy moved over the crest of the hill, Lieutenant Porubsky led his platoon in a charge which destroyed the hostile ranks with grenades and rifle fire, accounted for thirty enemy dead, and secured a vital position in the battalion defense line. Lieutenant Porubsky’s outstanding heroism, superb leadership and tactical ability reflects great credit on himself and the military service. Sylvester survived this action, but was killed five days later on 6 September, probably before he knew anything about being awarded the DSC. He left behind a wife, Audrey, the nurse he met during World War II and four children. Around the time that he was killed (1 – 8 September 1950), the North Koreans picked up the pace with their offensive that pushed the ROK and US troops to the brink. The KPA launched attacks on five different fronts, including Haman, which is the district Chilwon-ri is located. During this period, the Eighth Army and ROK Army HQ in Taegu was forced to retreat to Pusan. On 15 September 1950, UN Command troops launched Operation Chromite, which was the amphibious landing operation of Incheon Port. The location of Chilwon-ri, now Chilwon-myeon (myeon is the next level of administration after ri. Over time the population grew and was later upgraded to a higher administrative level) is approximately 53 km west-north-west of Pusan. You probably had some trouble with the exact spelling of the location, as the spelling of the town on the citation was based on the old pronunciation. Korean, being a phonetic alphabet, could be very confusing when written in English. Hope this helps, and please tell your grandmother that I greatly appreciate people like her cousin who fought in defense of my country. The Pusan Perimeter was the most important operation that allowed any counter-offensive to work, and Operation Chromite would not have been successful had it not been for people like those with the 25th Division. Black, Col. Robert W. “The Battalion: The Dramatic Story of the 2nd Ranger Battalion in World War II.” Stackpole Books, Mechanicsburg, PA. 2006. Pg. 239-240. Military Times. 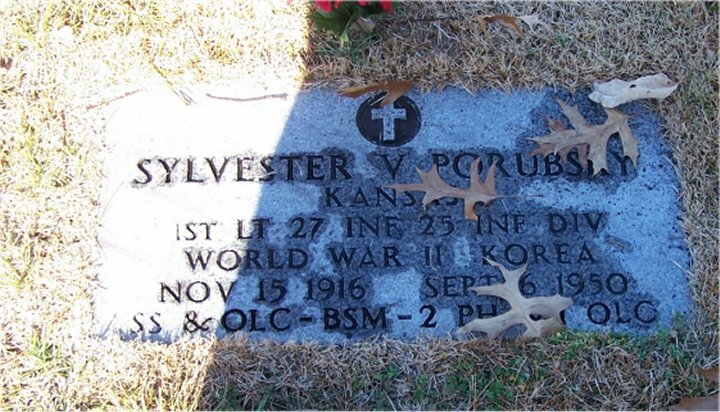 “Valor awards for Sylvester V. Porubsky.” http://militarytimes.com/citations-medals-awards/recipient.php?recipientid=7032. Accessed 1 Oct 2012. Prince, Morris, “Co. A, 2nd Ranger Battalion: Overseas then Over the Top.” Self published. Collection of the Command and General Staff College, Fort Leavenworth, Kansas. http://www.scribd.com/doc/33690719/WWII-2nd-Ranger-Battalion. Pg. 57. Thank you for your research about my Uncle Wes, my mother, the late Julia Porubsky Etzel's, older brother. Your Grandma Caroline was a dear friend of my Aunt Alvina (Andy) Hartman. I've been able to stay in touch with three of Uncle Wes' four children: Kay and Sandy, who both live in Cuyahogo Falls, OH, and Johnny, who lives in Atlanta. The oldest, Sylvia, lives in Oregon. Sharon, thanks so much for your comment. It's been fun to 'meet' family from around the country through this blog. My grandmother Barb, who is my great grandmother Caroline's daughter, lives in Tallmadge, Ohio. That's only about a 5 minute drive from Cuyahoga Falls. She would love to meet her cousins Kay and Sandy. Can you email me at joseph(dot)lowry(at)gmail.com so I can help put them in touch with one another. Below the story you will see a comment from a Richard Porubsky who lives in Wisconsin. I don't know whether he is related to us. His grandfather was Adam Porubsky, who came over from Slovakia. I know our ancestor Mathias lived in Austria-Hungary before moving to Kamenka, Russia, where my grandfather John and your great-great grandfather Carl were born. With the way borders have changed over the years, that could have been Slovakia, too. Just thought you might be interested in seeing that post.